When I arrived at Mendon, it was dark and rainy, not quite 40 degrees yet. Fitting for All Saints Day I suppose. I certainly felt a little haunted. By past mistakes and injuries and bad races. But I started this year with the goal to run 14 races for the pure enjoyment of them, no expectations, no attachment to the results. And somehow that strategy had lead me to the start line of a 50K, something I never thought I would ever even want to do, let alone be crazy enough to attempt. So I shrugged off the ghosts of Jens past and went to sign in and get my race bib, then hung out with the crew until the race started. 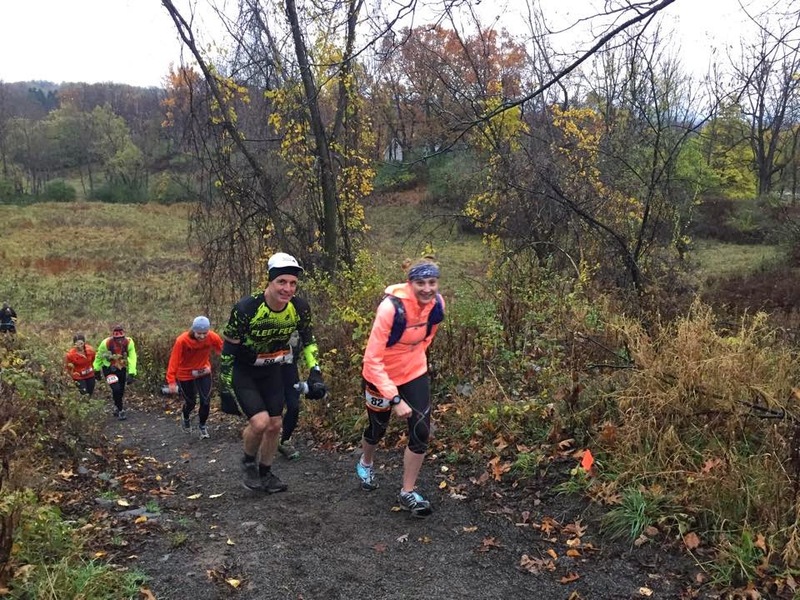 The course is a 10K loop with some great but hilly trails. No matter, because this is ultrarunning, where hills are for walking. Loop 1: I started off running with John and Steve and with the combination of fresh legs and funny conversations about prosthetic testes and the differences between eskers and drumlins and gremlins, this loop seemed to fly by. Soon we were back crossing the road heading to the start/finish. Chatting away, we naturally gravitated to the road leading back to the pavilion. I remember saying something like "oh hey, are we supposed to be running where those orange cones are over there?" but not really thinking anything of it until people started yelling at us that we had to move over and run through the finish chute where the timers were. We had a good laugh over that one, as the 3 of us are the kind of runners who could get lost running in a straight line. Loop 2: Again, the loop seemed to pass quickly, as time usually does when you have good company. By this point, the 10K, 20K and 30K runners had started and we got to see and cheer for a lot of friends as they passed us. It felt like running a race while simultaneously watching a parade. When we got back to the start/finish, we stopped to use the bathrooms. Assuming that all men pee way faster than I can, especially after I had to wrestle with my tights to get them pulled back on (seriously, for me the greatest struggle of this race was pulling my pants back up after the two times I stopped to pee. Those compression tights have a vacuum tight seal), I thought that John and Steve had already started the next loop while I was still in the bathroom. When I came out and didn't see them anywhere nearby, I figured I would just go my own pace for the next 3 loops. They are way faster and far more experienced runners and I thought I wouldn't have been able to keep up with them anyway. Loop 3: I knew that finishing this loop feeling good enough to go back out for the fourth loop was the key to my being able to finish this race. Each loop was getting progressively wetter and slicker due to the rain. Luckily, the running jacket I'd recently bought for $24 at Marshalls (because it has a sweet pocket on the back with a fold-out hood) was keeping me dry and the perfect amount of warm. Both Alison and Bob stopped to chat/run with me for a few minutes as they passed and that, plus knowing that I was never more than 3 miles from an aid station with friendly faces, made it easy to keep going. Towards the end of the loop, I came upon Andrea and we chatted for a bit as well. Loop 4: I don't remember much about this loop. I just put in my headphones and kept moving. I got lapped right at the end by two 50Kers on their final loop and seeing them get to stop at the finish knowing I still had another loop to go was a little disheartening, but everyone cheering at the TrailsRoc tent, plus Laura, Bob and Alison's encouragement at the aid station helped me get back out there. Loop 5; I was so tired I didn't know how I was going to pull off this loop. I felt like I was running in slow motion and my fingers had started tingling at random. Maybe it was just my brain getting fuzzy, but this loop was strangely magical. Early on, I came upon the first deer I'd seen all day. It was walking away from me into the woods but when I said "Hi, Deer!" it turned to look at me like "Hi, weirdo neon/spandex human." As I passed the water tower I was like "Hey water tower, this is the last time I'll see you today. No offense, but I am really getting sick of you." When I got to 25 miles, I thought every step you take from here is the farthest you've ever run on trails and when I got to 26.3 miles I thought every step you take from here is the farthest you've ever run in your life. Later I met a guy named Jamie from Syracuse and talked for a bit as we ran. 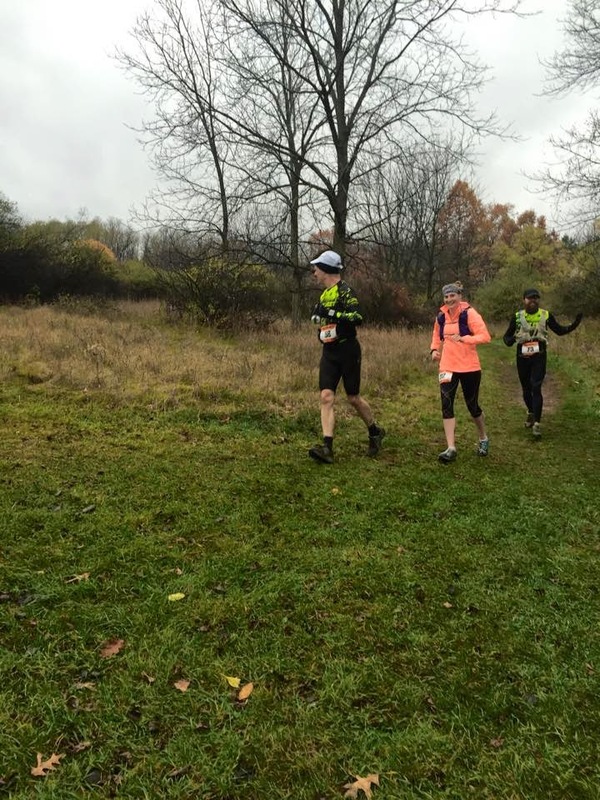 At the aid station, I heard excited cheering from Liz and from Danielle, who had been pacing Tammy for her last 2 loops. Tammy felt good so she went on ahead and Danielle stayed with me. My whole body hurt but thanks to Danielle, I was having a great time. We were laughing and talking about the adorableness of our dogs and then suddenly without my noticing it we were back at the road crossing heading to the finish. I was so happy to be done running and to see/high-five/hug so many friends. So my friends, I think I just became an ultrarunner. And even though I broke my rule of not running for longer than I slept (it took me a little over 6.5 hours to finish), I think I'm going to like it here. Oh my god what have I done? Thank you to Race Director Brian Thomas for putting on such a challenging and well-run race. Bonus points for ensuring some fabulous weather. I was really working on my tan out there. Thank you to my trail family for all the training runs and conversations and for coming out to run and/or cheer today. The sheer amount of awesomeness at this race was beyond belief. Congratulations to all on your epic achievements out there! You lovely people are the reason I would rather be running 31 miles in the cold and rain than at home sleeping like a normal person. Thank you to Pete for putting up with my ridiculousness, for letting me borrow your deodorant and your watch, for all the love, support, hugs, dark chocolate, the wings for my shoes and the pizza dinner. And for being the best thing I ever found on a trail. Lyric of the moment: "I do it for the joy it brings. Because I'm a joyful girl. Because the world owes us nothing and we owe each other the world..."